OK, I'll admit it, I'm a tree-hugger. I grew up in a city of trees (Minneapolis) and although I've lived in the desert for a long time, I still feel better around trees. I like looking at them, I like parking my car under them, I like walking under them. If you're confused about trees in Phoenix, it's not surprising. When I first moved here, when I was 19, there were very few trees. I just figured that it was because it was the desert. 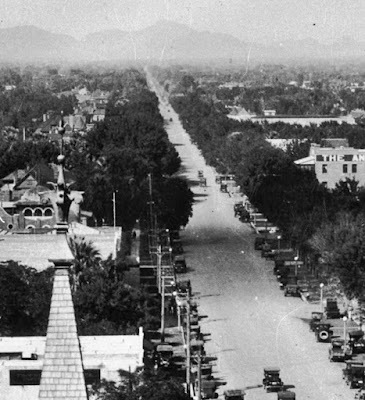 Then I found out that Phoenix used to be a city of trees. Looking north up Central from Monroe in the 1920s at a city of trees, Phoenix, Arizona. 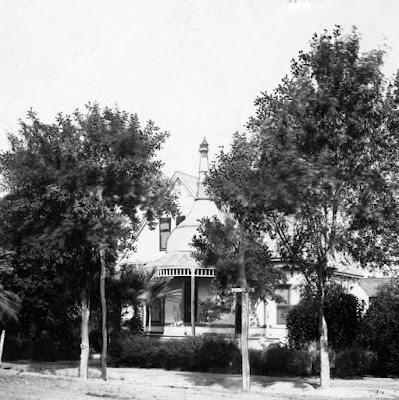 Whether it was along the road to good intentions, the trees which had shaded Phoenix since the 1870s started to disappear in the 1970s. I've looked for a lot of reasons, the widespread use of air conditioning, the need for more parking spots, the expense of trees, and the fact that trees require water. There are a LOT of reasons why the trees went away. So I have despaired, and written stuff like this, where I feel that I am a voice in the wilderness. Bring back the trees! And to my surprise, I see it happening. Trees are being planted in downtown Phoenix, new buildings are including trees in their design. I've even seen beautiful desert-adapted trees in the medians on Grand Avenue (Texas Mountain Laurel - sophora secundiflora). And then there are acacias (sarcastically called "parking lot trees"), mesquite, palo verde and palo brea. And that's great, but it's just a start. Because no matter how many trees are planted by the city, most of our city is made up of homes. And as I drive around Phoenix, I see millions of places where trees could be planted - front yards, and backyards. So if you want Phoenix to be a city of trees again, plant a tree, and care for it. Image above: the Evans House, which is on Washington at 11th Avenue. And yes, there are trees nearby.